This past year I had a supreme honor and opportunity I never thought I would have. Visiting the Happiest Place on Earth with some friends we all were given the chance to dine at Disneyland’s most coveted restaurant: the illustrious Club 33. It’s a place some Disney attendees don’t even know exists. And those who do, know that being able to dine there is rare and special. It’s a place that was originally formed for Walt Disney to entertain VIPS and dignitaries in the park, away from the hustle and bustle, to relax with fine food and elegant decor. Now it’s a Club that has a limited members list, with the chance for non members to attend based usually on knowing someone who is. I knew this was probably a once in a lifetime occurrence so myself and my friends soaked up everything and thoroughly enjoyed ourselves. The service was impeccable, the food divine and the entire atmosphere grand and yet intimate. Club 33 is indeed a beautiful place and I will always cherish that I was able to attend, and with people who are so dear to me. Our lunch consisted of 4 courses. Here was our menu. I ordered the Steak Tartare of Filet Mignon, the Tricore Salad, the Grilled Angus Filet Mignon, and Chocolate Profiteroles. To say the food was delicious is an understatement. It was delectable and one of the best meals I’ve ever had. We were celebrating my Friend’s upcoming wedding, so also they treated us to an extra dessert of delicious beignets. And in between courses and after lunch we were able to take as many photos as we wished. And I certainly was inspired! The décor alone was lovely, but the view onto New Orleans Square and the Rivers of America on gorgeous wrought iron balconies was just exquisite. You already feel special when you are there, but this made it feel even more so. Of course, a visit to Club 33 wouldn’t be complete without getting a few souvenirs to commemorate the occasion. Even the bag the purchases come in is pretty and fancy. I picked up what was called a paper weight, but something I have hung up on my wall, along with a lovely key chain. 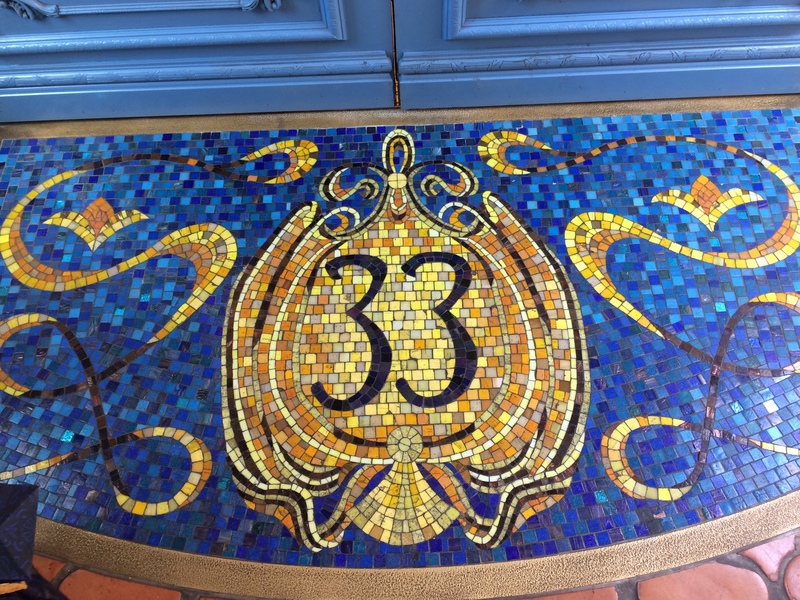 If the chance to attend Club 33 ever comes your way, do not hesitate. It’s a special experience and I know I will always be grateful I got to visit, even if it was just once.I will cherish this day always!! Well, just in time for Valentine’s Day, but truly something you can do all year round, I thought I would try my hand at some Captain Swan inspired cake. Truth be told, it did not turn out the way I was hoping but such is life so I thought I would share what I did, and the results anyway, as well tips and ideas for the future. These are available on Amazon. The Swan here, The Hook here, with a similar heart ones here. – Grease the bottom and side of the pan to prevent the cake from sticking. Make sure to use a lot. I did not and some of the cake did stick. – After mixing the cake mix I poured about half of the mix into the pan, creating a thin layer. You can judge for yourself. – Bake for about 20-22 minutes depending on the oven. The recipe for the entire mix says 30-35 minutes but using only half the cooking time is less. -Once cooled I cut out the shapes and carefully pulled away the edges. They did not pull away easily. The hearts turned out the best. The Hooks were pretty good, but the swans were very difficult. – The excess of cake I put all together or you can just snack on it. – The rest of the cake mix I made into 8 cupcakes, baking for 20 minutes. The idea was to frost the swans with the white frosting and use some red food coloring for the frosting on the hearts, while leaving the hooks plain. Frosting the hearts was simple, but attempting to frost the swans proved nearly impossible because they were very delicate. These were the results. After trying this once I can say that using a soft cake is probably not the best for these cookie cutters. I think perhaps a more substantial brownie or traditional sugar or chocolate cookies would work better. And I think I will definitely try those sometime. Despite everything I did enjoy the project. It may not have turned out as beautifully perfect as the Captain Swan love story, but it was still fun, and the cake tasted delicious! It’s certainly a great treat to enjoy while watching the Captain Swan wedding for the 100th time! If you try this out or have any other fun baking ideas let me know in the comments! !